This is the first valve radio overhaul I've done for many years and, as I approach retirement, I'll definitely find more time for this activity. Work has been tailing off the last week or so... maybe my prices have gone up too much and put people off? 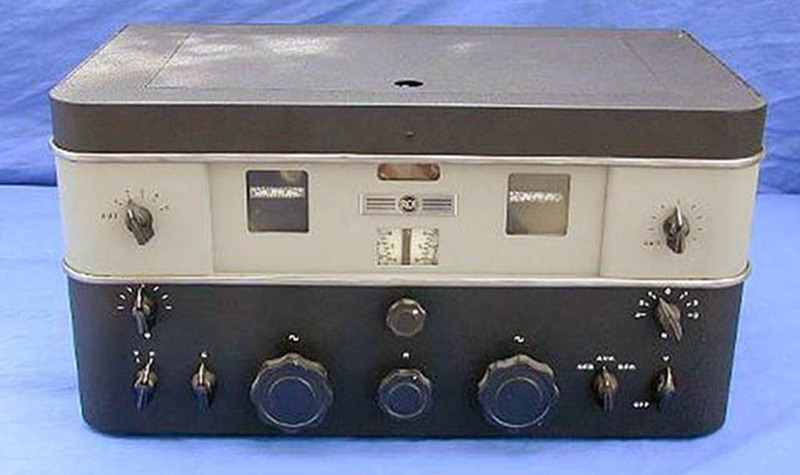 This particular model of the AR77, which is a superhet designed primarily for the amateur radio enthusiast, was first sold in 1939 and has a different front panel to later models. 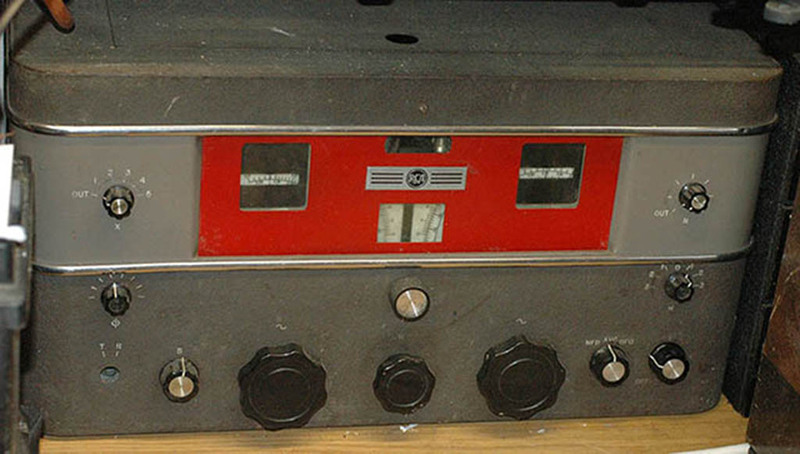 It's been in the hands of a radio ham or shortwave listener for most of its life as the 40 & 80 metre bands are pencilled on the dials. Bearing in mind the receiver is 75 years old it will probably need a collection of new parts. I'm not a purist so replacements will be sourced from what's readily available. Some people like finding replacement parts that are the right vintage, or dig out the innards of old condensers and fit new capacitors inside the old cases. When it comes to resistors most will be of the carbon rod variety. The smaller type nearly always drift up in value because the connections between the wire ends and the carbon deteriorate and, as new old stock parts also degrade in this way, it's best to use modern reliable components. Some people completely strip a chassis and clean or replace the parts with new. I'm afraid I don't go that far as I like to see an equipment look its age. A bit like patina on an antique. When tackling a radio overhaul such as this, getting organised is vital. Besides getting hold of information on the set and its valves, you must also prepare yourself mentally. There will be high voltages present, unlike most modern equipment, so the utmost care must be taken in working on a powered chassis. Remember that modern test equipment is designed for use on equipment where the highest voltage present is no more than 30 volts or so. 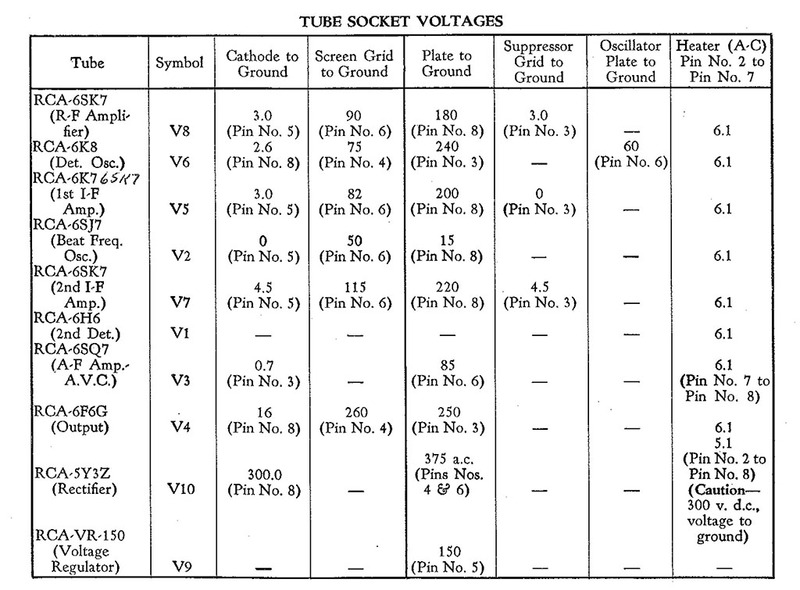 Valve sets will employ an HT line of anything up to 300 volts and more so check the rating of scope input sockets and in particular the rating of a spectrum analyser input. There are many sets that don't use a mains transformer, instead being wired directly to the mains. 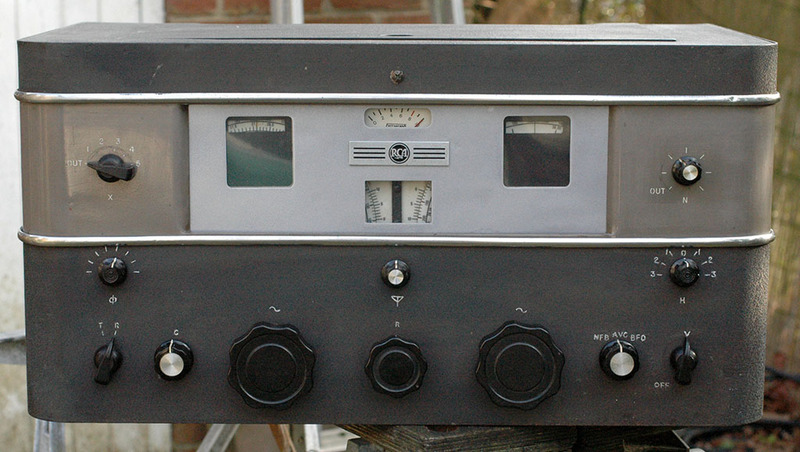 These are "live chassis" sets and include a host of Eddystone receivers. Before AC mains became standard, lots of towns had DC mains and set manufacturers catered for these by making "universal" sets... meaning powered from AC or DC mains. 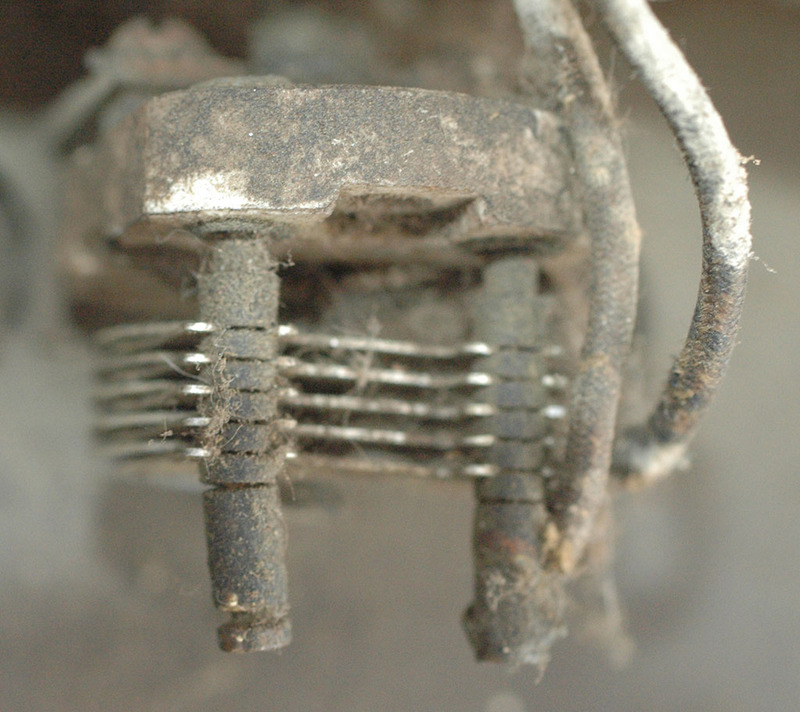 No mains transformer means that the chassis connects directly to the mains and, as many sets had a two pin mains plug and had a two pin plug on the back, it's a 50% chance that live mains rather than neutral connects to exposed metalwork once the case has been removed. Ideally use an isolating transformer as you can then work without the live chassis risk and, more importantly, don't blow up your scope by connecting its case to the chassis of the set. In fact I'd say do not proceed to dismantle a live chassis set until you've got yourself an isolation transformer and be aware that some transformers are not isolation transformers, but are "auto-transformers" which do not isolate their input common connection from their output. Something else needs to be pointed out here in the UK and Europe. Most receivers made in the USA are designed for 115 volt mains and need to be operated from a step-down transformer. The first step in a potential overhaul of an old set is to gauge whether or not the exercise will be worthwhile. I mean by this that there must not be anything insurmountable. To this end check some fundamental things like the mains transformer primary, see that the various mechanisms are intact and complete, look for missing valves in case there's one that's hard to get and see if there's anything vital that's broken beyond repair. As a rule of thumb, an old receiver that hasn't been used for decades might have been put away because something really nasty happened to it. Something either very expensive to have repaired or an impossible to get part had failed and you are now retracing the steps of an enthusiast 40 or 50 years ago! If everything seems reasonable get hold of a circuit diagram and/or an operating manual and make some notes. For example, here's some useful information regarding the AR77. The mechanical layout of the AR77 is quite complicated so I made a sketch of the underside and the top of the chassis showing the valve types and transformer locations. I also familiarised myself with the valve connections. This was useful because some had totally different pinning to common valves. For example the 6SK7 and 6SJ7 valves have their anode brought out to pin 8 rather than the more usual pin 3. Once I'd got enough information to make sense of things I did some basic tests and found it was safe to plug the set into UK mains. There are several communications receivers around that plug into 115 volt US mains but this AR77E is an export model and thankfully has a 240 volt mains transformer. Powering an old set with an unknown history can be a risky business but I have a large variac so I wheeled this out and connected it up. My variac is an early Air Ministry version in an open frame so I built it into an old computer case with a couple of meters showing me the output voltage and the current consumption of the load. Cranking up the output voltage made the pilot lamps come on so things were looking good but I left the output at around 200 volts or so briefly and made some measurements. The HT was present and there were no burning smells so I increased the voltage to 230 and waited. 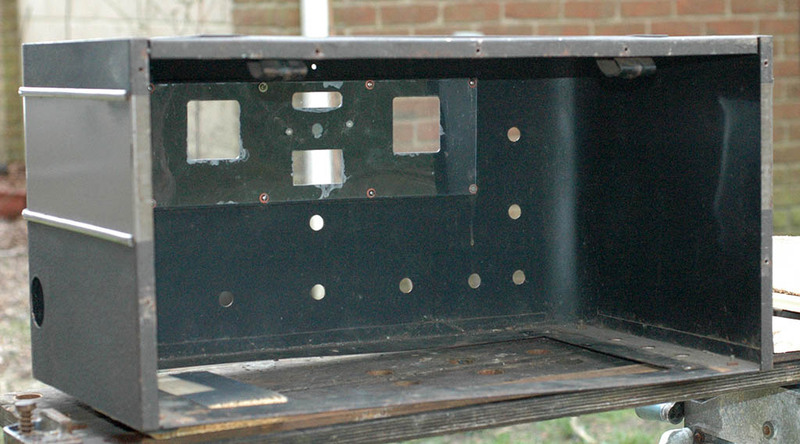 The set was upside down in its outer case with the baseplate removed so I could see into the chassis. After a few minutes there was a burning smell so I switched off. Using my hand as a temperature sensor I quickly found an 8uF condenser that felt exceedingly warm so I removed it and noticed the pitch at one end was recently melted. I should point out that the condenser might have been saved if I'd applied a lower voltage for a longer time. This might have have restored the condenser rather than wrecking it. This condenser was in parallel with a section of the original smoothing condenser. I say "original" but in fact it looks like a 1960s type with "Made in England" on the side. This replacement includes smoothing with a reservoir condenser and the can was cold to touch. I disconnected both wires to the condenser live tags and measured both halves with an ESR meter. Both were roughly correct and had resistances of less than half an ohm. Oddly the hot 8uF condenser measured 10uF and a third of an ohm but it clearly wasn't up to the job so I didn't reconnect it, just the ones in the metal can. Powering the set a second time proved OK. No nasty smells at least, and the voltages at the two condensers measured about right according to the charts in the user manual. At this point, although the set had a number of obvious problems, I connected the aerial input to a signal generator set to 455KHz, the supposed IF of the AR77. Despite an input of 100mV I heard nothing so I commenced measurements at the valve pins and quickly discovered that a couple of valves were missing their anode voltages. This was not wholly unexpected because at the front of the AR77 is a Transmit/Receive rotary switch and mine was missing its spindle so most likely the set was operating in transmit mode with a number of valves unpowered. Access via the underneath inspection panel is limited so the next step was to remove the receiver from its outer case. 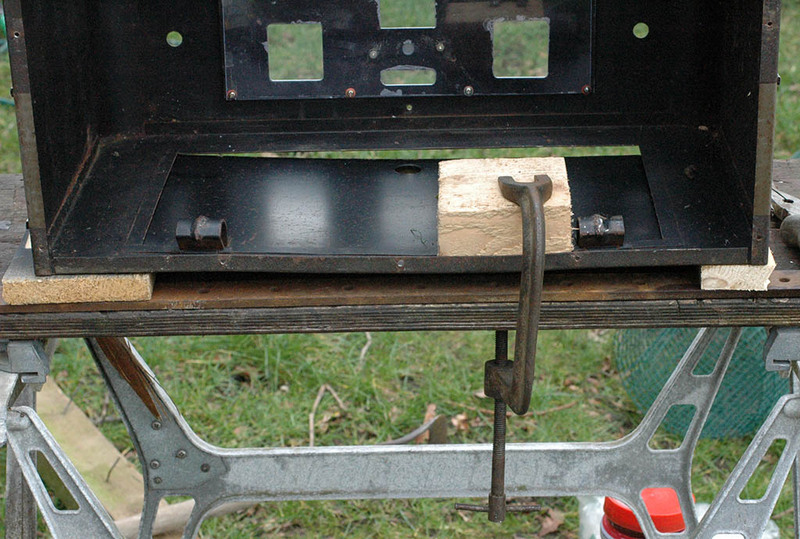 Removing the chassis was straightforward as the knobs came off easily which isn't always the case. On the left isn't a quarter inch jack socket; it's the Transmit/Receive switch missing its spindle. Note that the waveband windows are in the wrong positions. The twin dials are in excellent condition and the front is very clean compared with the rear and top of the chassis. The next picture shows the front end RF components. plus the rectifier and stabiliser at the back. The large central box holds the main and bandspread tuning capacitors and at the rear you can see the aerial trimmer capacitor. The final IF transformer, detectors and audio output valve are at the far side with the mains transformer, and you'll note the aerial input socket is mounted on a small piece of black crackle finished metal. A modification carried out by a previous owner. I don't know what the recommended workshop procedure is for handling a chassis like that of the AR77, but I usually make up a set of wooden legs which I screw to the sides of a chassis. These are long enough to prevent the dial and valves etc from grounding on the bench when the set is upside down and I needed to drill a couple of extra holes in the chassis to hold the legs in place. Fixing screws are countersunk so the set can be turned onto either end for access. The wooden legs enable the set to be turned over without damaging anything. This picture shows the assortment of knobs fitted by the last owner, although thankfully the three centre knobs are correct. Once the set was upside down I could see the T/R switch was missing its wiper as well as its spindle. In fact the wiper was wedged inside the wiring at the opposite end of the chassis. Finding a replacement was a little tricky and the immediate options were to use a two pole toggle switch which would mean drilling out the fixing hole (and it wouldn't look good when the set was back in the case), or to use a three way switch in place of the two-way switch (my junk box was devoid of a suitable 2-way switch). As my three-way switch was electrically suitable I fitted this and soldered up the wires to the appropriate tags so the positions were Transmit-blank-Receive and I used a stand-off to remove strain from the new switch solder tag because I had to solder all the connections to the new switch before wiggling it into position and securing it. Once I'd fitted the new switch and powered the set for the third time I was rewarded with loud crackles when the wavechange switch was rotated and, switching on the signal generator, gave me a good response at 455KHz. I turned down the output to around 1mV and tweaked the IF transformers. All needed tweaking slightly and there was no problem peaking the signal. I used to use an old Avometer set to AC volts to monitor the audio output but I picked up an audio wattmeter on Ebay many years ago and I now use that. Once I'd verified the IF strip was generally OK I removed the signal generator, plugged in a long wire aerial and turned the wavechange to medium waves. Clearly the set was working well as all the wavebands were incredibly noisy and I was able to tune into a strong station playing pop songs from the 50s. Checking the frequency proved the set was tuned to about 825KHz. This turned out to be Classic Gold 828 in Bournemouth. Unfortunately there are now a large number of problems still to sort out, but having established that the set is working well I don't mind tackling them. The following list will probably not be exhaustive as new problems may show up as work proceeds. (1) The last owner used loose parcel string on the main tuning dial and it slipped badly. The next picture shows the main tuning drive with parcel string and with a second cord wrongly located and connected to the wavechange switch. The parcel string wasn't wholly to blame for the slippage because the wavechange cord above the chassis was sharing the main pulley and causing drag which made the loops round the drive spindle slip. Once the latter was fixed (see 3 below) I was going to leave the parcel string in place but I decided against this when I found that tuning was too sloppy. Replacing a dial cord is a messy business but eventually I got it done. This picture shows the bandspead tuning mechanism with decent drive cord and again with wavechange cord wrongly located. (2) There are no adjusting screws in the tops of the IF transformer cans. Should there be? This was a real puzzle until I checked the circuit diagram and compared it with the chassis drawings. There are five IF-style cans. T5 is the BFO coil and this is adjustable. 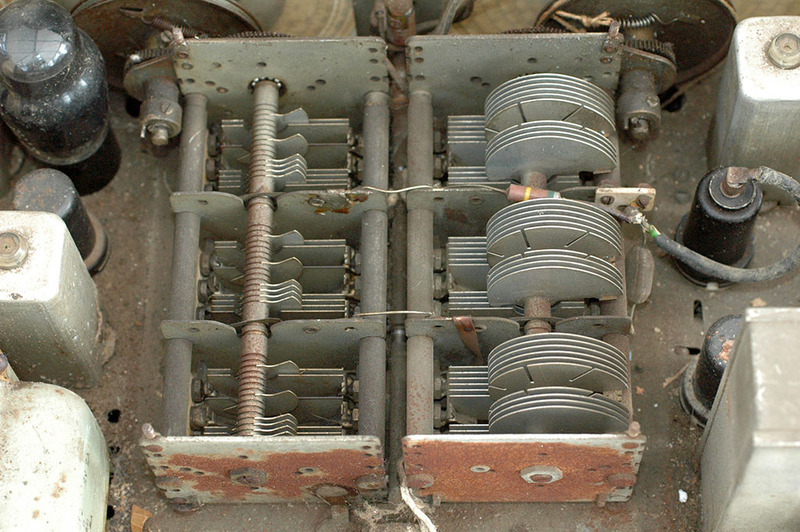 T1 is the mixer output transformer with a single tuning slug; T2 is the IF amplifier transformer with two slugs (top & bottom); T3 and T4 are shown as a single double-tuned transformer but is in fact split betweeen two cans, one either side of the chassis tuned from the underside of the chassis. After puzzling over the routing of the wavechange cord and peering at the mechanism, I noticed a pair of one inch idler pulleys mounted near the chassis. These were clearly designed to be used for routing the wavechange drive cord and, judging by their condition, hadn't been used for 50 years or more, so I removed the old cords which were completely wrong and fitted a pair of new lengths, securing one end with a knot around each screw head shown below. I then wound a couple of turns around each drive pulley and passed the ends up through the elongated holes in the chassis. 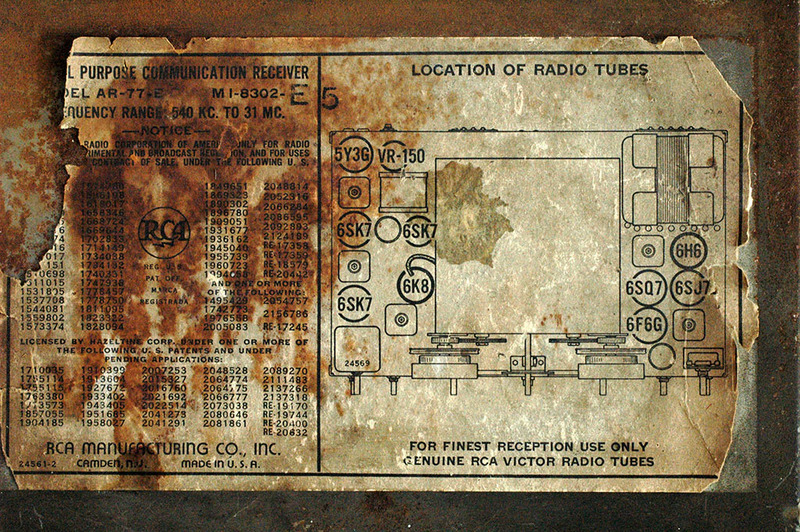 Where the cords had been wrongly routed over the shafts the metal was highly polished so clearly the old receiver had seldom showed the correct band and had probably suffered from tuning slippage. No doubt a source of extreme annoyance to its pevious user! Above the chassis each cord passes over its corresponding one inch idler pulley and is secured at an adjusting screw at the top of the waveband indicator.The adjusters needed sorting out as bits were missing. Each needs three nuts, two for securing the adjusting screw to the top bracket and the third for holding a small plastic bush in place. The plastic bush is used to secure the end of the drive cord and prevent chaffing. Moving the adjusting screw downwards lowers the indicator window and vice versa. Fitting the cords has to be done with the indicators at the top of their travel with the wavechange switch positioned at the highest band. Then, as the wavechange switch is turned to the lower frequency bands, cord is wrapped around the drive pulleys and the indicators step downwards revealing the tuning scales for the selected band. Each of the indicators (main tuning and bandspread) has to be carefully positioned by setting the adjusting screw. Above the scales for the highest bands are the logging scales which are only visible at the verniers. Note that the drive cords have to be always in a state of tension otherwise they will drop off the idler pulley and the indicators will be out of adjustment. I added a spot of superglue to each knot in the cord to prevent it slipping. The old cords which I removed had very complicated knots. Maybe the last owner was a boy scout? The next day I decided to fire up the receiver and check it still worked before tackling the next job on the list. I plugged in the mains lead and the loudspeaker then the aerial and twiddled a few controls until I could hear noises. I then set the wavechange switch to Range 1 and found the medium waveband to be fairly quiet with just a few stations, and these seeming to be in Arabic. Strange.. so I set the dial to 1MHz and plugged in the signal generator. Nothing much to be heard so I changed the frequency of the generator until I could hear louder and louder clicks. Digital generators are OK but not easy to swing up and down a band. Having found the clicks to be loudest I altered the next digit (the 0.1MHz digit) until at 8MHz a big signal appeared. At this point the penny hadn't quite dropped as I'd been thinking the medium waveband had been modified to say Top Band, then I realised what was going on. Tuning the generator to 24MHz an enormous response appeared. I wasn't listening to the medium waveband on Range 1, but Range 6 and the set really was tuned to 24MHz. The reason was that the waveband windows were moving the wrong way because the cords were winding the wrong way, despite having made a sketch of the original parcel string. I'm now wondering if the receiver was ditched because of this problem or maybe I'm just getting senile? I had to go through the whole process of fixing the cords yet again. I looked at the BFO can and found it's only secured by a single nut. Because the whole weight of the set was resting on the can at some stage in the past the aluminium had become distorted and could no longer be held in place by its single nut. I straightened out the can and refitted it. The parts inside looked OK. If there's even the tiniest leak this will forward bias the 6F6, making it very hot and reducing its life. The AVC or AGC circuitry is also highly dependent on the quality of its decoupling capacitors because of the high impedances found in the circuitry. I measured all the resistors and found only one that had failed completely. This was the BFO anode load resistor marked 100Kohm and it was open circuit. The 6F6 cathode resistor measured about 800ohms and should be 470ohms so I'll fit a new one which will increase the audio output. Nearly all the remaining resistors were reasonable apart from one 470kohm that read around 700kohm. 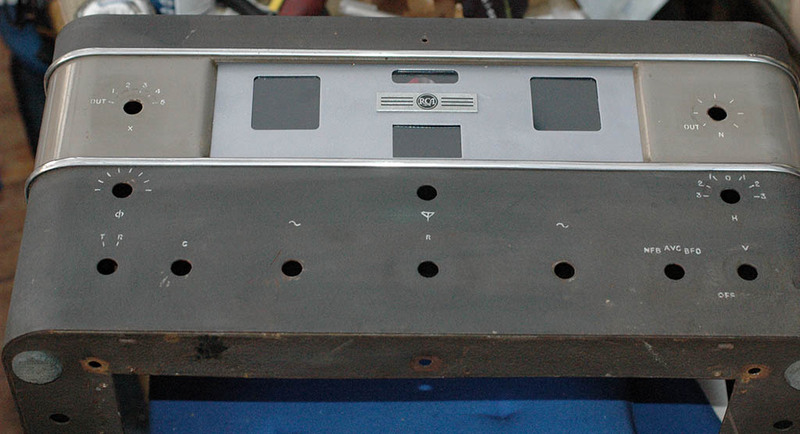 Below is a picture of the tuning capacitors revealed when the metal lid is removed. You can see that things are not straightforward because the main tuning capacitors (on the right of the picture) not only have three sections, but each section has two sets of stators & rotors. This technique allowed the designers to vary the width of each waveband without having to resort to high accuracy capacitors in series with the tuning capacitors. The highest waveband will use the smallest sections, the short wavebands the larger and the lower frequency bands both sections linked together. On the left is the bandspread tuning capacitor. This is even more complicated as each of the bandspread sections of the main bands is allocated its own tuning capacitor. Hopefully, although the circuitry is quite complicated, the end result is simple as all the wiring is carried out in the wavechange switch. Two technical aspects are involved in aligning the receiver; resonating coils at the dial markings and ensuring the local oscillator coils track with their associated input frequency coils. These two tasks are referred to as tuning and padding. The latter is often a laborious process and sometimes (if someone has resorted to random twiddling or a critical component needs replacing) requires a knowledge of the basic design of the particular set. Because the receiver is a superhet you need to know whether the oscillator should be 455KHz above or 455KHz below the RF input. I'll go into more detail once I've tackled this task. 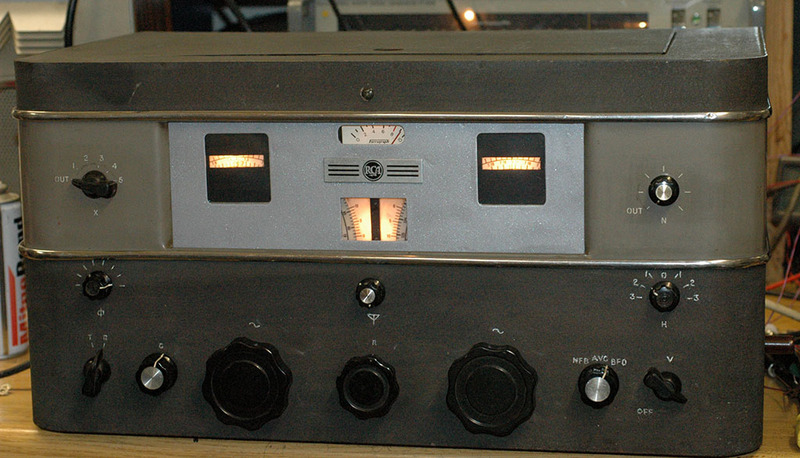 Below is a picture of the aerial tuning capacitor located at the back of the chassis, connected by a long shaft passing between the two main tuning capacitors to a knob on the front panel. I'd noticed a crackle when adjusting it and the reason is obvious. It's had a bang and the end stator vane was bent so that it rubbed against the rotor as this was turned. It straightened when eased back with pliers, curing the annoying crackles. As the case is painted a warm coloured black crackle and I had a cheap spray paint called Japlac metallic lilac bought at our local surplus shop, I used that. Above is the finished plate with the RCA badge refitted. I found a 1mA Ferrograph meter of the correct diameter for the fixing bracket and as the parts list does not specify a sensitivity I'll have to try it and see if it's suitable. 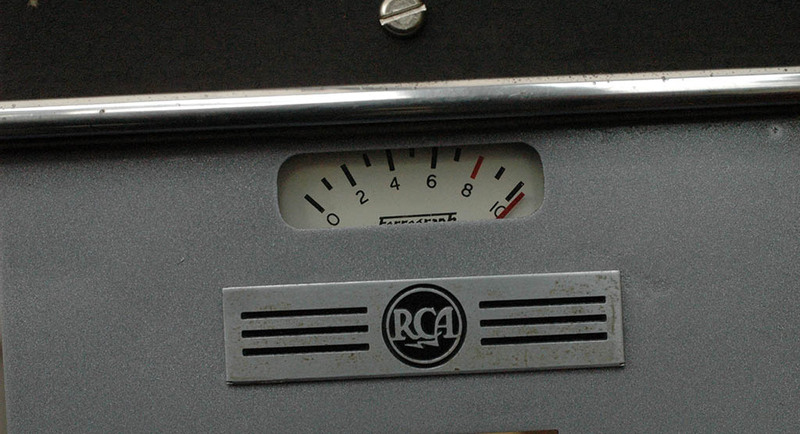 The new meter is a backwards reading type calibrated 1 to 10 which turned out to be perfect for the AR77. Above is the new meter installed. The manual is silent on the type of meter but this old Ferrograph meter is perfect. It reads back-to-front and has a 1mA movement and seems to behave just right. I can set the zero reading using the rear mounted potentiometer to "0" and maximum strength signals push the reading to a little over "8". I removed the old brittle yellow plastic sheet behind the escutcheon and fitted a new sheet of clear plastic. I removed the extra loudspeaker because I don't like the sound from case-mounted loudspeakers. Below is just about the only colour picture of an AR77 I could find on the Net. This one has a different hue to mine but seems to have the correct knobs. Above is the case as it was when I started. Below is how it looked after repainting the escutcheon and rubbing some black paint into the crackle finish. This usually seems to work and just revitalises the original colour and keeps the well used look. I'll need to find some correct knobs which apart from the central four are the old style of pointer knob which are currently available from my two main suppliers for about 50p each. Now, a few more pictures showing how I tidied up the case. Below... parts of the case were badly distorted. The case with new perspex and inverted on a workmate. After reassembly being tested on 40 metres. There are a few outstanding things to sort out. The noise limiter doesn't work and the crystal filter needs tweaking, but performance generally is really good..